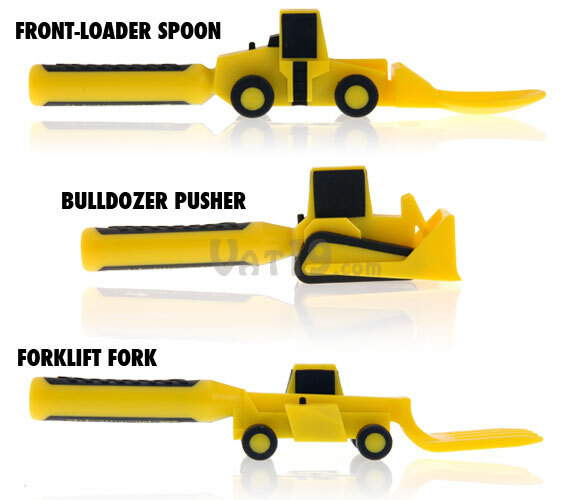 A forklift fork, a bulldozer pusher, and a front-loader spoon make up the most playful children's utensil set we've seen. Each Constructive Eating Utensil features true-to-life coloring, shape, and scale. The easy-grip handles and attention to safe materials make these utensils a worry-free addition to your mealtime arsenal. Dishwasher safe, 100% non-toxic, and BPA-free. Constructive Eating Utensils are pretty much the most awesome dining accessory a child could wish for. Each utensil's true-to-life coloring, shape, and scale will encourage the devouring of all foods, including those dreaded veggies. Kids of all ages will dig in to every meal with their Constructive Eating Utensils. The Constructive Eating Utensil Set, as expected of items designed for kids, is completely safe. It doesn't contain any paint and is completely free of lead, BPA, and phthalates. The set uses all FDA-approved materials. 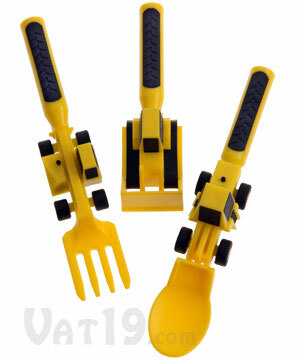 So, let the kids have a little fun at mealtime using these construction utensils without any worries. Our test subject, a 19-month-old lover of waffles, dug right in with her Constructive Eating Utensils. Constructive Eating Utensils are completely non-toxic and consist of FDA-approved materials. 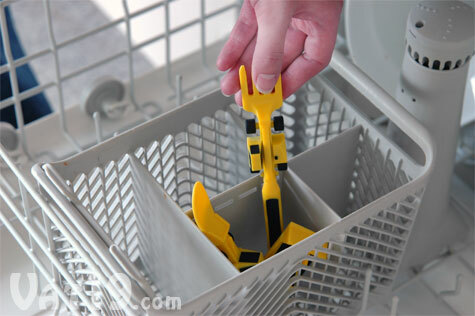 After a messy day on the job, clean off your kid's Constructive Eating Utensils with a quick rinse in the dishwasher. Clean-up is a cinch with the dishwasher-safe Constructive Eating Utensils. 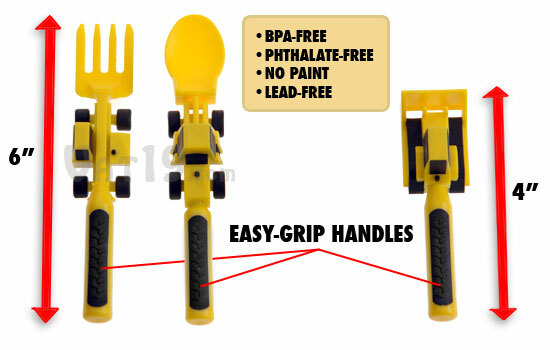 Each set of Constructive Eating Utensils features a front-loader spoon, a forklift fork, and an ingenious "pusher". The pusher helps young kids funnel hard-to-maneuver items (such as peas) onto their spoon or fork. These rugged, colorful, and true-to-life construction utensils will encourage your kids to eat nearly anything you put on their plate. Your set of Constructive Eating Utensils includes a front-loader spoon, bulldozer pusher, and forklift fork.